King Solomon had harsh words for the wicked, those who seek to harm others and entice them into evil deeds. Now, his Proverbs on the subject may speak especially clearly in the aftermath of last week’s events in Boston, where two homemade bombs killed three, injured 170 and sparked a manhunt that riveted not just the city but the whole country. We use the word “events” to describe what happened in Boston quite deliberately. Because, although numerous media outlets and even the President himself referred to last week’s happenings as a “terrorist attack,” that may not officially be so – at least for home and business owners suffering property damage and loss due to the bombings and the manhunt that followed. In Boston, the bombings killed three people at the Marathon, injured over 170 others and triggered a massive manhunt that put whole neighborhoods on lockdown, with residents under orders from law enforcement not to open doors except to uniformed offers. The President and many other officials immediately called the events a terrorist attack. If that’s the case, a little known insurance provision put in place after the 9/11 attacks could provide compensation for property damage. But as a new article in the journal of the American Bar Association points out, that might not happen, unless the Secretary of the Treasury, the Secretary of State, and the US Attorney General agree to the designation and the damage total exceeds $5 million. 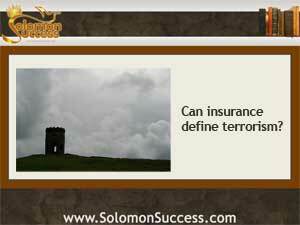 The Treasury Department’s Terrorism Risk Insurance Program was implemented to offset damages caused by terrorist activities and efforts by law enforcement to counteract them. As it stands now, the program extends through the end of 2014, with options for renewal at the discretion of Treasury officials and the President. Claims made under the provisions of TRIA would be made directly to the Department of the Treasury. But unless total damages sustained in an event like the Boston Marathon bombings exceed the $5 million threshold, those events won’t be considered acts of terrorism at all.